UNCW faculty and staff were recognized for their achievement in research funding during the Researcher’s Recognition Reception held Sept. 12. The annual event recognizes those who submitted grant proposals, received an award or were involved in innovation and entrepreneurship during Fiscal Year 2017. More than 130 faculty and staff attended the reception hosted by the Office of Sponsored Programs and Research Compliance (SPARC). Researchers secured award total was $11,414,279 in funding in FY2017, compared with $9,644,717 awarded in FY2016. Advancing research and scholarly activities is among the university’s strategic priorities. The newest members of the James F. Merritt Million Dollar Club were also announced during the reception. The club honors faculty who have received more than $1 million in research funding. This year’s inductees are Rachel Kohman, assistant professor in the Department of Psychology, $1 Million Club; and John Morrison, professor in the Department of Physics and Physical Oceanography, $5 Million Club. The Merritt Club is named for the director emeritus of the Center for Marine Science. 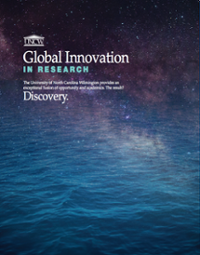 During his 34-year career with UNCW, Merritt procured more than $14 million in grants and contracts to support research endeavors at the university. The club includes more than 100 members from departments across campus.